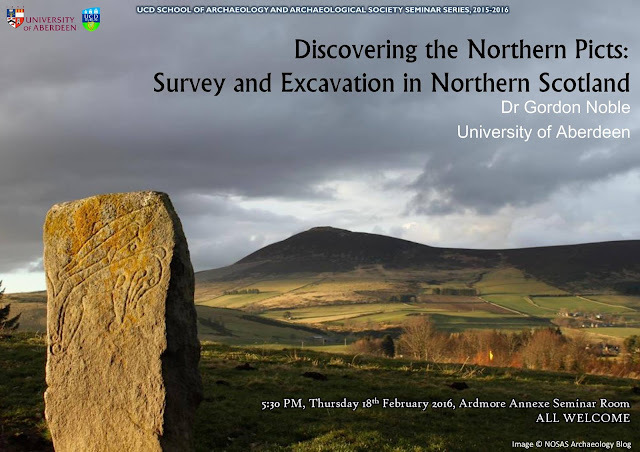 "Discovering the Northern Picts: Survey and Excavation in Northern Scotland"
This seminar focused on fortifying rulership in Northern Britain, in relation to the Picts. The period in question was the transition of the Iron Age to the Early Medieval period. This seminar was informed by Dr. Gordon Noble’s research in the Northern Picts Project. The focus of this project is Eastern and Northern Scotland and the Picts people, with a particular focus on Early Medieval Scotland (circa 400-900 AD). At this time in Scotland there was a great diversity of people. The Picts were distinguished by their carved stones and metalwork. Areas researched as part of the project include forts, burial practices, environment, and symbol stones, as well as possible domestic settlements. Cé is one of the areas included in the project. The origins of the Picts have been a source of confusion for historians and archaeologists in the past. At this time the origins of new forms of social hierarchy and authority were widespread. As a result of this complexity, the project uses interdisciplinary means to aid in its research, and material culture is utilised to define new relations of power. The anthropogenic and archaeological signatures of kingship have left their mark on Scotland. Increased ritual power and the sacred role of the leader were shown through the power they exerted on nature. This led to sacred and exclusive objects and distinctive burials and monuments. Irish written evidence has been used to enhance the project. These documents provide evidence of kings as leaders in war, justice and religion. They were involved in clientship which was materialised through military service, hospitality and annual labour, for example constructing ramparts. Kingship was also seen as part of the world order, and making things run as they should. The historical sources used in this project include Ptolemy’s Geography, which uses 1st century AD information, and mentions many tribes. The Picts are mentioned from the 3rd century AD as a source of trouble for the Romans. This sudden mention of the Picts could be as a result of the consolidation of tribes to counteract the threat of the Romans. The mention of fewer tribes in later Roman sources could support this theory. Other sources include the kinglists of the 8th century AD, which note Pictish over-kingship by the 7th century AD. Later sources emphasise royal centres in the South. The archaeological record is now being used to trace the origins and development of the Picts. This record includes symbol stones, fortified sites, and cemeteries. The writing system identified on the symbol stones is believed to mark out powerful individuals. Metalworking symbols on the stones are seen to be symbols of power. The Late Bronze Age and Iron Age hillforts which reemerge in the Post-Roman period were central to the kingship of these powerful individuals, according to the sources. The origin of these symbol stones is generally taken to be the Late Roman period- 8th/9th centuries AD, but there is no real consensus. They originate in Northern Pictland. These stones have been dated relative to Christian monuments. The symbol stones and fortified sites form the main sources for the project. One of the sites studied is Dunnicaer, which is a fortified site with carved stone monuments. Its promontory fort dates to the Pictish period. One of the structures there, Beannachar House, has Pictish stones in its association. These stones were found in 1832 by village youths but not studied until much later. The dates of the site are early- 3rd/4th century AD. Roman sources say that the Picts were sea raiders, which may mean that this site’s coastal location was a natural choice. Rhynie is another fortified site studied for the project. The name means a place associated with a great king. It was a high status fortified site dating to the 5th/6th century AD, and was contemporary with the stones found there. This famous group of Pictish stones are more polished and elaborate than those found at Dunnicaer. They are an earlier type, as there is no Christian symbolism on them as on other stones. Symbols on these stones include fish, the Pictish beast, and the famous Rhynie Man. This was an important find as human representation in Pictish stones is rare. One of these stones was also left in its original location, which is rare with such stones. This provides a rare study opportunity. Ditches and a palisade were found nearby. Imports were found at the site, including a Late Roman amphora from the Mediterranean and dating to the 6th century AD. These are rare in this area; they are found in South-West England at high status sites. Only two other sites in Scotland boast such a find, and both have royal associations. Glass from Western France which formed a beaker for wine was also found, and this is also a rare find in Eastern Scotland. High status metalworks such as bronze pins, brooch moulds, and exceptional iron tongs, which are also represented on the stones, were also found at the site. The site has been dated from 450-550 AD, and is seen as a landscape of power. This was an Iron Age fort which was reused in the Early Medieval period. A high status cemetery and square barrows dating from 450-550 AD were also found. A stone socket for a standing stone was discovered at the entranceway of the fort, near Rhynie Man, with a deliberate deposit of a cattle jaw bone placed at the bottom. This is a secular site but there are cult and ceremonial associations. Axe carrier symbols were found which have animal heads and elaborate teeth, similar to Rhynie Man, and could be interpreted as shamanic figures. There were similar axes to those represented found at the burial of Sutton Hoo, and Lagore crannóg in Meath. These were royal sites which also had animal remains, which were sacrificial at the burial and mostly cattle in huge quantities at Lagore. This shows how kings may have been implicated in the religious practices of their people. Burghead was also studied, and is the largest Pictish fort. It is a promontory fort with monumental walls and depictions of bulls which may relate to animal sacrifice. Early Christian sculpture has been found, as the site was used to almost 1000 AD, when Christianity was spreading. Little excavation has been done, and the site was damaged with the building of a town on top of it. Test excavation revealed intact Early Medieval deposits and a cattle bone midden. Radiocarbon dates of the rampart place it in the 5th/6th century AD, the post hole to the 6th century AD, and the midden to the 9th/10th century AD. Almost all of the forts studied date to the 5th century AD, showing them to be Post-Roman phenomena. Some sites, such as Rhynie, became disused during the 6th century, while the larger forts, such as Burghead, continued to be used for longer periods. This may mirror the rise of the overking in the sources; less centres of power as power becomes more centralised to certain areas. In conclusion, warfare was materialised through enclosures which were important to the Northern identity in the 3rd/4th century, but this may have been geographically restricted. There may also have been use of sacred and restricted script to denote emerging elites in the same period. Bands of clientship allowed forts to be built in the late Roman and Iron Age periods, but these were consolidated from the 5th century AD and in a Post-Roman context. In the 5th/6th century an element of the divine and sacred was introduced in relation to rulership. If you would like more information on this project, it can be found through the Tarbat Discovery Centre’s website, and the Northern Picts Facebook group.